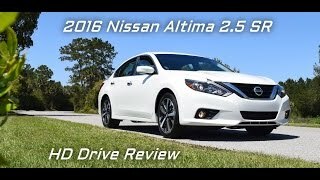 For those who have been in connection with the predecessor Altima models, the all new Nissan Altima SR 2016 is full of surprises. The new model from the house of Nissan is an entire facelift that won’t just offers you a sportier exterior but also brings a well crafted interior and all this without compromising with the mpg figures. Let us not delay and have a closer look at the review of Nissan Altima SR 2016 to know more about it. 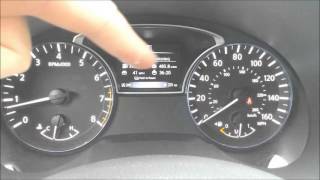 Though the company didn’t receive any big complaint for the interior of predecessor models but with the interior of Nissan Altima SR 2016 they have proved that, they always have something better for their customers. The cabin comes with a new center stack while the center console gets house for new cup holders. The seats, steering wheel and the door panels feature accents of blue. The leather wrapped refined steering wheel and the gear shifter look amazing. There is also a five or seven inch display mounted over the dashboard featuring NissanConnect SM with Mobile Apps and also NissanConnect Navigation with Mobile Apps looking after the infotainment and entertainment. 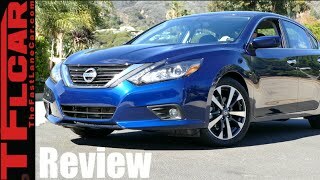 In all rounding up the interior details of Nissan Altima SR 2016 I would say it has everything to steal the gleam in this competing automotive era. 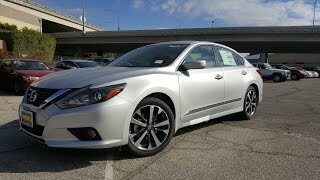 I won’t say the exterior of Nissan Altima SR 2016 is an overhaul as the specifications are almost unchanged but the design elements integrated nowhere keeps it in the ancestors queue. Starting with the front fascia the model comes with a new V-shaped grille sitting boldly amidst the elongated slim headlights. Beneath his set up is a beefed up bumper with redesigned fog lamps and an air vent in between carrying the trend of the grille. Moving towards the rear end changes get more enhanced with the those new graphics surrounding the taillights and further getting accompanied over their boulevard till the trunklid with revised chrome trim and new spoiler. Not only these has the bumper too got a muscular touch getting complimented by the sportier exhaust pipes. 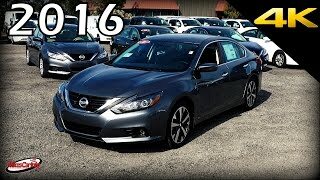 In all rounding up the exterior details of Nissan Altima SR 2016 I would say it is an elegant and sportive car rolling over those 17” and 18 “ wheels. Beneath the hood of Nissan Altima SR 2016 are two powertrain options; first is a 2.5 liter DOHC four-cylinder engine generating total output of 82 hp and peak torque of 244 nm while second is a 3.5 liter DOHC V6 engine cranking total output of 270 hp and peak torque of 340 nm. While the former comes paired to Xtronic 7-step ‘manumatic’ with specially tuned Gen 3 D-step logic transmission latter mates with same but with paddle shifters mounted behind the steering wheel.